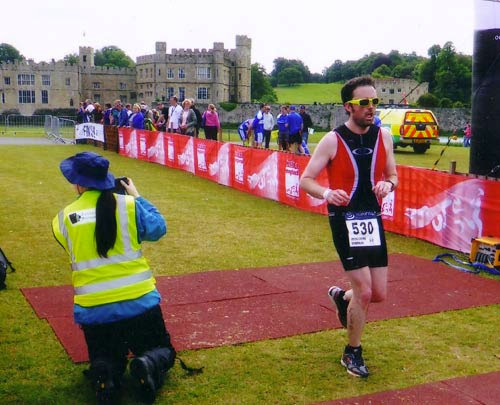 Having grown up just down the road I was embarrassed to admit this was the first time I had ever been to Leeds Castle for its first ever triathlon. As it was the first year of the race I wasn’t able to do much research on what the course was like other than a bit of a chat with some blokes from the local triathlon club. The water was very shallow and once the 100 or so people in the wave climbed in it kicked up a lot of mud making visibility zero. It was quite a tight swim course round the moat and comfortably the best swim I’ve ever done. There was a lot of traffic throughout which I prefer as it stops me drifting off which tends to happen if I’m swimming on my own for a long time. The rolling, windy bike was tougher than I thought and I was very disappointed by my time but looking at the results it seems to have been quite slow for everyone. It wasn’t the pancake flat drag strip I was hoping for. Cheesy promo video below – I’m the one in the yellow hat. The run was also slow by my standards but was a very tough cross country 5km double loop. Some of the hills were so steep they left some seasoned racers walking up them. I can’t claim I’m happy going over three hours for an Olympic distance race but races like the London Triathlon are far easier than this one. I’m glad it was challenging as I’m more likely to have another go next year.